Find Western Digital products online and buy from the best online shops in New Zealand. Western Digital, sometimes called WD or WDC for Western Digital Corporation, manufactures hard disk drives. They are one of the largest manufacturers of these types of devices in the world, and one of their main competitors is Seagate. The company has been in the field of electronics since the beginning, but they did not start with HDDs. WD started with capital provided by the Emerson Electric Company, as well as some investors. The first items the company sold were far different from the hard drives they became known for later. In the beginning, they were selling chips for calculators. They started in the early '70s, and by 1975, they were the largest chipmaker for calculators in the world. Things changed in 1976 though due to the oil crisis and the fact that the company biggest customer was having issues. Western Digital actually had to file for bankruptcy. When this happened, Emerson Electric Company stopped supporting and funding the company. Western Digital did not give up though. They continued to work in the field and to create new products, including microcomputers. They improved their chip technology with the FD1771, which helped them turn their fortunes around once again. By the early 1980s, Western Digital was starting to get deeper into the field of hard disk drives and data storage. This was becoming an increasingly important part of the field of electronics and computers during that time, and it was where the smart money was for their business. One of the best things to happen to the company in the early ?0s was getting a contract with IBM to provide controllers for the PC/AT. During the 1980s, the company was again on the rise, and they started to solidify their role as an OEM hardware supplier for companies in the PC industry. They started to buy up a number of other companies that produced other types of hardware so that they could expand their offerings to those PC companies. They bought companies producing graphics cards, core logic chipsets, controller chips, disk controllers, and more. The addition of these other companies and their assets gave Western Digital an advantage over some of their competitors. Once again though, things slowed for the company during the 1990s when the PC makers were starting to use different types of drives, namely SCSI and ATA drives. This required that Western Digital rethink their business and the products they were developing. Their new Caviar drives started to take off and sell well enough that WD actually started to sell off some of their subsidiaries so they could focus more on the drives. Of course, technology continues to change, and by 1995, other drives were selling better than their Caviar drive. They had a difficult time with the other products they were offering, and it was actually working with IBM again that finally pulled them out of this slump. They had an agreement with IBM that they would be able to use certain IBM tech in their products. They even had access to IBM facilities during this period. WD only had a brief relationship with IBM, but it was enough to help them get out of trouble. They began producing ATA drives in the early 2000s. They continued to grow and they again started to buy up other companies that had assets they deemed valuable. One of those companies was the Read-Rite Corporation. They also bought Komag, a magnetic media maker. During the 2000s, Western Digital started to create high capacity hard disk drives for storage, both internal and external for businesses and for the consumer market. 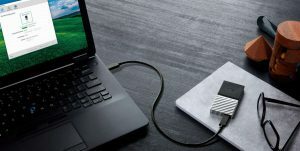 As the need for more storage space expanded in the consumer world, companies such as Western Digital answered with easy to use data storage options. In 2009, they shipped the first internal HDD with 2TB of space. Today, Western Digital offers a range of quality products, including high capacity and high-speed internal and external hard drives and thumb drives. The My Passport line is particularly popular. They also recently got into the desktop media box arena with their WD TV offerings, which are direct competition to items such as the Roku, Apple TV, and Amazon Fire TV.